Is the Dyson Supersonic worth the money, or is the ghd Aura still the market leader? We pitch the two against each other to find the answer to the question “what’s the best hairdryer?” Here’s our Dyson Supersonic vs ghd Aura comparison review. This is one area where the two dryers differ significantly. The Dyson Supersonic users an intelligent heat-control system that feeds data up to times per second to a microprocessor. The technology is designed to regulate temperature and keep outputs at non-hair-damaging levels. The ghd Aura’s heating element is the result of three years of R&D and is pretty different to the Dyson Supersonic. It uses a ceramic heating element to prevent airflow from overheating. While this isn’t as sophisticated as the Dyson Supersonic in terms of technology and microchips, it’s just as effective. Both the Supersonic and Aura employ Ionic technology to dry your hair faster. The science behind this is that negative ions have been found to significantly improve the breaking down of water molecules. Ionic technology produces millions of negatively charged ions which are infused with the hot air flow to speed up hairdryer times. The Dyson Supersonic’s intelligent heat-control system is impressive technology. However, it’s a little superfluous for a hairdryer. Regulating the temperature via the choice of material, like the Aura achieves with ceramics, is just as effective. Both devices use of Ionic technology is good to see. See also: ghd Air review: The BEST hairdryer you can buy for under £100. The Dyson Supersonic isn’t shy about using technology. It’s heat-control-system, mentioned above, is testament to the fact. The motor powering Supersonic is unique. It’s Dyson’s new V9 digital motor that spins at 110,000 revolutions per minute. Dyson is claiming it achieves an “inaudible frequency” beyond the range of human ears thanks to the use of 13 blades rather than the traditional 11. This isn’t strictly true. You can still hear the whirl of the motor working, but it’s definitely muted. We’ve recorded the Dyson Supersonic operating at levels as little as 75dB. The GHD Aura also debuts new bits of technology. The Cool-Wall Nozzle and Laminair technology. The Cool-Wall Nozzle is a new feature that keeps the outer casing and nozzle cool during use via using a wall of cool air. It’s designed to let users work much closer to the hair and scalp with burning themselves. The use of what ghd calls Laminar technology helps the hairdryer produce 42% more concentrated air (compared to its previous models). This has been designed to allow more precision when drying hair letting you focus on one section of hair without disturbing other areas. Both hairdryers debut new technologies and both work really well. We really like the precision you can achieve with the Aura, while the Dyson’s motor and lack of noise are a real positive too. Dyson’s aim with the Supersonic was to reinvent the hairdryer, just like it did with the vacuum cleaner. Has it achieved this? Not really. The Dyson Supersonic is definitely different. It’s beautifully designed and looks great, something you’d expect from James Dyson, (alumni of the Royal College of Arts, just like Apple’s Chief Design Officer Jony Ive). The ghd Aura is more traditional. It just looks like a hairdryer should. Both devices have designed their units to distribute the weight differently. The Supersonic has its motor and the majority of its 700g weight located in the handle. This creates a balanced and non-top-heavy feel, making it comfortable to hold aloft for the several minutes needed to dry your hair. The ghd Aura has opted for something different altogether. It’s moved the power pack out of the gun altogether, positioning it a few feet away further down the cable. This redistributes the 1.54kg weight totally, keeping some of the bulk out of your hands. 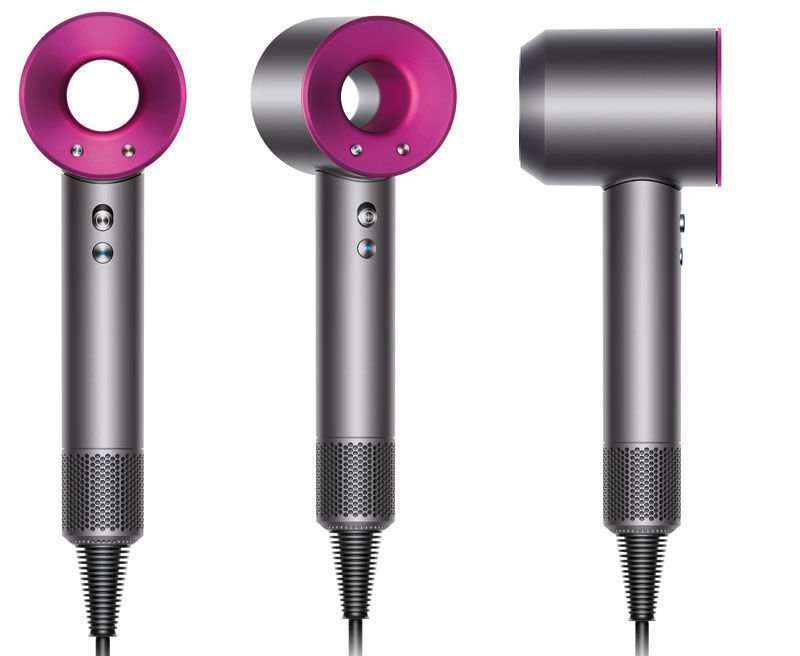 The Dyson is visually stunning and doesn’t even weight half as much as the ghd Aura. Add in the totally balanced weight distribution, largely due to the motor being located in the hairdryer’s handle, and the Dyson Supersonic is a clear winner. Here’s an area where Dyson’s tinkering has perhaps gone a step too far. The Supersonic has three speed and four “precise” heat settings: 100°C Fast drying and styling; 80°C Regular drying; 60°C Gentle drying; 28°C Constant cold. Great. However, it’s fiddly controlling these settings as both the speed and heat buttons are located at the back of the dryer on the fan. Meaning you can’t quickly adjust setting with your thumb or finger as you can on regular hairdryers. Your setting level is indicated via small LEDs located at the rear of the device too, meaning you need to pull it away from your hair and move it into view to check your level. Not ideal. The ghd Aura is a much more standard affair. IT comes with two speed and three heat settings. These can all be controlled while in use with your thumb. Both hairdryers come with a cold shot setting that can be activated via a trigger button located where you forefinger naturally rests. The ghd Aura is easier to operate, but Dyson’s wider range of settings give you greater control which, is ultimate, what you want from a hairdryer. Both hairdryers are fantastic and sit at the top of the industry regarding performance. The Dyson is a stunningly designed piece of technology that challenges the conventional thinking of the market. Whereas the ghd Aura is the exact opposite. It’s a hairdryer that combines all of the industry’s best bits in one device. Considering the DNA of both theses hairdryers are totally different the end results are incredibly similar. Both hairdryers are fast, quiet and will blow dry your hair in a controlled way that will leave it looking shiny, styled as desired and voluminous. Which brings us on to prices. If you can afford it, the Dyson Supersonic is the hairdryer of choice here. It’s more powerful, lighter, faster and the quieter of the two devices. However, at £349, it costs more than double than the £145 ghd Aura. To sum up, there is no bad choice here, but buy the Dyson Supersonic is you can afford it. Read next: Best Home IPL Hair Removal Devices 2017.